Stoles suggest a position of religious or spiritual authority of the person who wears one. They are a powerful, visual symbol that a community affirms the spiritual and leadership gifts of the person wearing it--whether it be as a pastor, priest, elder, deacon, minister, or some other title. For decades (and currently still) churches and faith communities have grappled with the full inclusion of LGBTQ+ people as members, but also as faith leaders. Queer faith leaders have been kicked out of their churches, pressured to revoke their positions or stay in the closet in order to keep serving the way they feel called by God to serve. 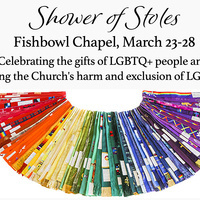 The Shower of Stoles is a collection of over a thousand liturgical stoles and other sacred items representing the lives of gay, lesbian, bisexual and transgender people of faith. These religious leaders have served in thirty-two denominations and faith traditions, in six countries, and on three continents. Each stole contains the story of a GLBT person who is active in the life and leadership of their faith community in some way: minister, elder, deacon, teacher, missionary, musician, administrator, or active layperson. This extraordinary collection celebrates the gifts of LGBTQ+ persons who serve God in countless ways, while also lifting up those who have been excluded from service because of their sexual orientation or gender identity. The collection bears witness to the huge loss of leadership that the church has brought upon itself because of its own unjust policies. Sponsored by the United University Church.